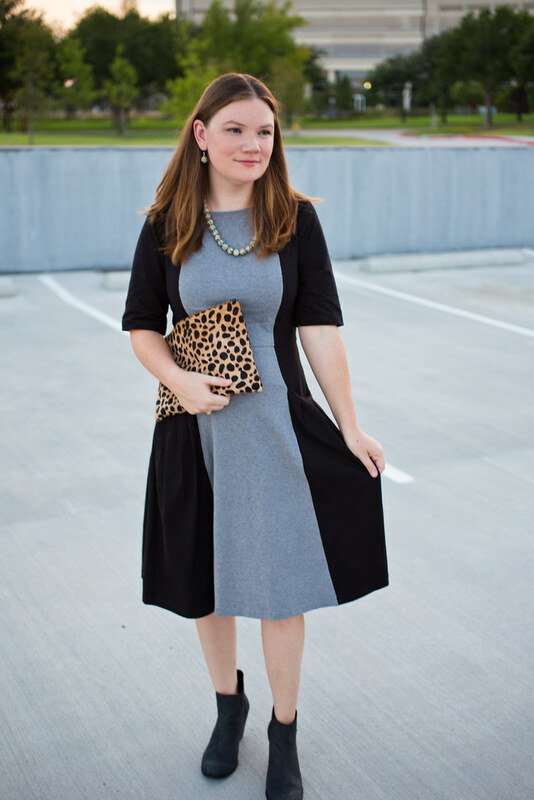 This is my second dress from eShakti and I have to say — I’m hooked. The original dress was more summery, with cap sleeves, a scoop neck, and a shorter hemline. I was able to adapt it for fall, though, by adding longer sleeves, a longer hemline, and a boatneck collar, all at no charge! You can even send them custom measurements and they’ll adapt the design for your size. How awesome is that? The fit and flare silhouette and color block design make this dress extremely flattering. Plus, it has pockets, making it essentially the perfect dress. 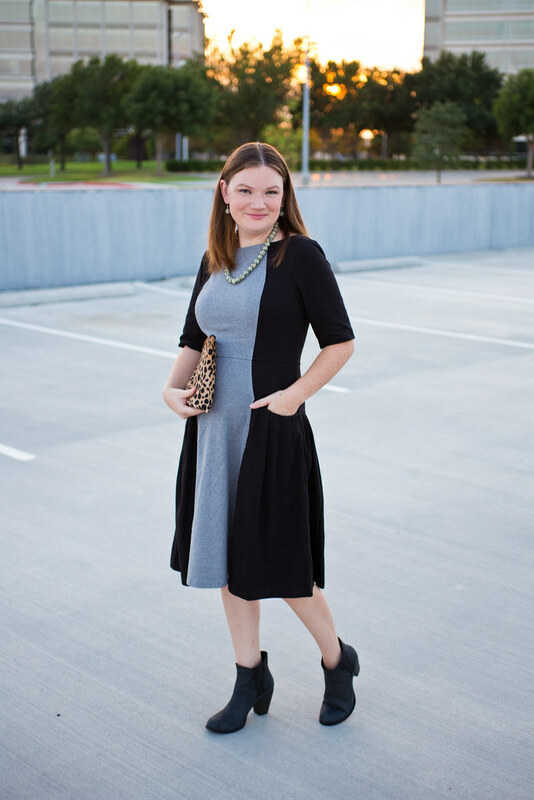 When the temps finally cool down, I’ll pair it with tights and heels for a night out. I love how structured and LONG their dresses are! I’m not even tall and I feel like I’m always struggling to find dresses that are cute but long enough to be work appropriate! Love this look….so classy! 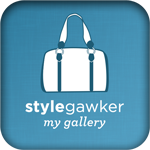 Great dress – I really enjoy eShakti too. Thanks for sharing with Visible Monday! 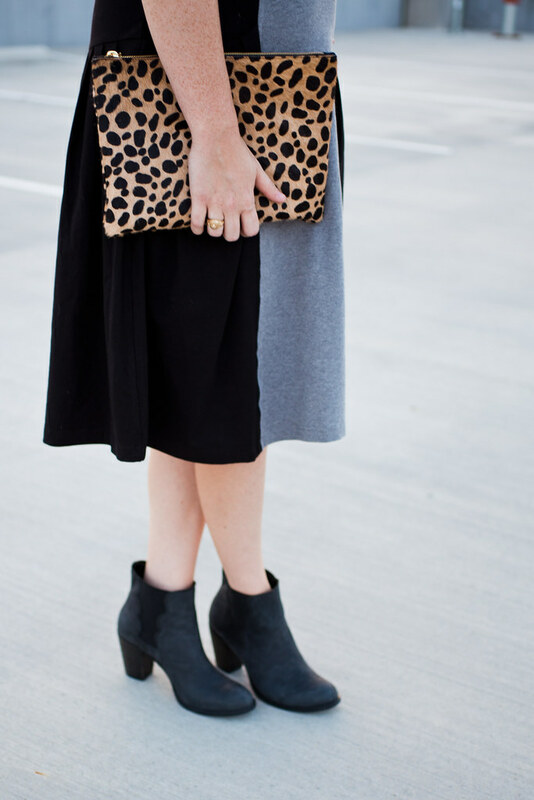 Gorgeous dress, love the blocking and the length, so cute with the boots and love the leopard clutch! Oh Wow. I really love that dress. It has pockets too! How awesome. Your clutch is just perfect. I love your booties too! love the pattern, very flattering. 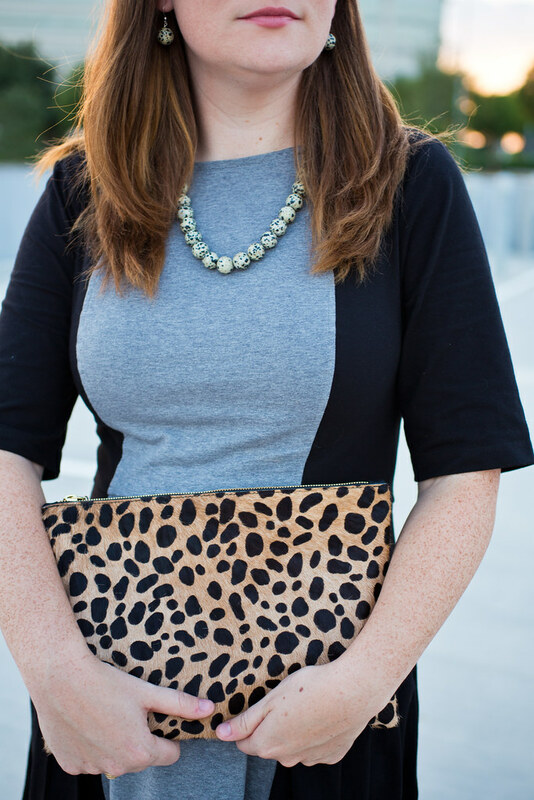 Love the pop of leopard with this! And what a fun and flattering dress. 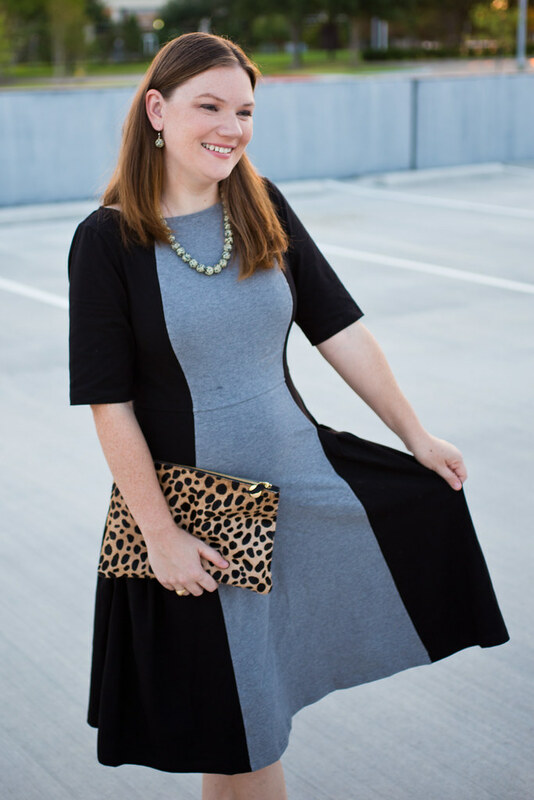 I always love seeing what people pick from eShakti because I feel like it really speaks to their personality since everything truly is custom made for you! 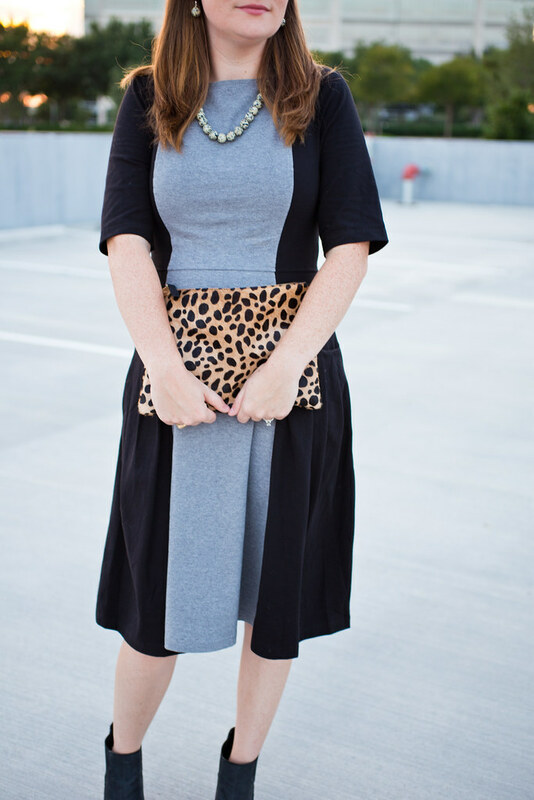 That being said – I love this dress and how you have accessorized it! 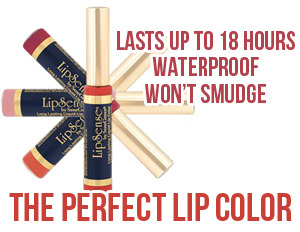 You wear it well! Thank you for sharing with Manic Monday!